The Vedas tell us that spirit is composed of eternity, knowledge (or consciousness), and happiness. Both God and we souls possess spiritual forms, which are free of the limitations of material form. For example, each part of a spiritual body can perform the function of any other part. 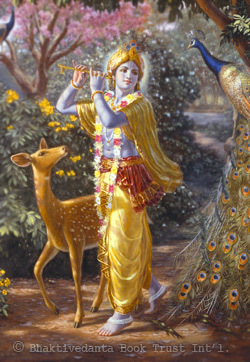 Krishna’s body never changes; He is an eternal youth. Unlike us ordinary souls, who may possess a material body, Krishna and His body are always identical. The Vedas describe Krishna in this way: He is a beautiful youth with a glowing complexion the color of rain clouds. He plays a flute, attracting the hearts of all. His cheeks are brilliant, His smiling enchanting. He wears a peacock feather in His curly black hair and a flower garland around His neck. His beautiful garments are the color of lightning. His toenails resemble the light of the moon. Not only do the Vedas tell us what Krishna looks like, but pure souls have received His audience and written of their encounters. And fifty centuries ago, Krishna revealed His transcendental form to residents of India when He lived there for 125 years, sometimes showing and sometimes hiding His divinity.